Your taste buds are about to meet your perfect match as Macao Imperial Tea introduces the most delightful PorkEVER Deals! 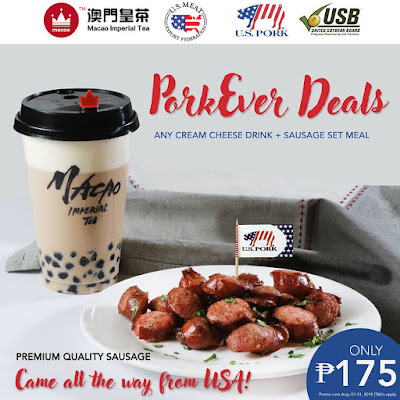 Enjoy your favorite Cream Cheese beverage with high-quality U.S. Sausage for ONLY P175.00! 1. Promo is valid from August 1 - 31, 2018. 2. Customers may avail a set meal that comes with ONE (1) Cream Cheese Beverage (any flavor of their choice) + ONE (1) U.S. Sausage (choices of: cheddar cheese, garlic, smoked) for P175.00 only. 3. Valid for both dine-in and take out customers. Not valid for delivery. 4. Valid in all Macao Imperial Tea branches nationwide. 5. Promo cannot be used in conjunction with any other promos, gift certificates, and discounts including Senior Citizen and PWD discounts.